BEST SELLERS: P.C.Cast is known for her Goddess Summoning and Partholon Series. House of Night is her first series with her Daughter Kristin Cast. SYNOPSIS: She thought taking Geometry test was the most frightening thing that would happen to her, until she was Marked by a Vampyre* Tracker. Meet Zoey Redbird, a sixteen-year old teen from Tulsa, Oklahoma, who has a whole new life awaiting her at the House of Night Boarding School, Tulsa. The Deal? Well, she is different from every other vampyre fledging. The Sapphire Colored Crescent on her forehead is already filled in and she experiences bloodlust which grosses out every other vampyre kid till they reach their fifth-sixth formers (Our equivalent to Senior Levels or Sophomores). And not to forget the pearls of wisdom given to her by the Goddess of Night Nyx who speaks to her through her intuitions. "Darkness does not always equate to evil just as Light does not always bring good"
And the Biggest Deal? Making through the Change (for becoming a vampyre). If she cannot, she will die coughing and drowning in her own lungs - and if she does make it through, she would finish becoming a vampyre! MSM Speaks: I saw one of my friends' reading this book and just lifted it to flip through. I finished 104 pages in one go....it was that interesting. I felt sad when I had to return it and then checked out the actual book. Man! This is so not your typical vampyre stuff. I mean, there are no fangs, unnecessary hissing, sudden appearances et al. 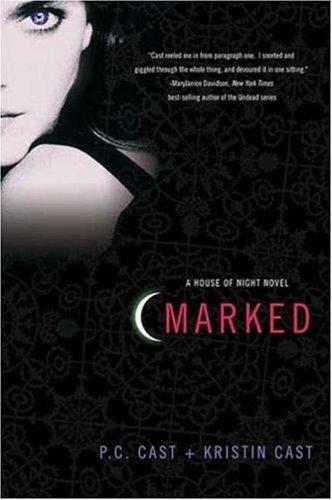 It is the story of a teen juggling between her sucky human parents who think she is daughter of Satan because she is Marked and her fear of new vampyre life that would begin at the vampyre finishing school called House of Night. Zoey Redbird has a very loving Grandmother, who reminded me of soft blanket and home. P.C.Cast and Kirsten Cast rock as a duo, with P.C.s in depth historical knowledge and Kirstin's modern perspective. The Folklore, Paganism, Wiccan and North American rituals are meshed so well, you would feel like trying them out! I swear. Marked embarks on Zoey's journey of new life, beginning as an advanced fledgling. She gets bonded with the Goddess of Night Nyx and feels accepted in her new group of friends which include her roommate Stevie Rae, Damien (The Gay Uber Genius Friend), Erin and Shaunee (The Twins). Not to forget the hag from hell Aphrodite - who tries to make Zoey's life hell, but fails (Woohoo!). *Vampyre: The spelling used by P.C.Cast which she thinks, looks cool. I agree. Additional info from MSM: Vam - Pyre means according to old myths as "Some one who burns in Fire (Pyre = Fire)"
PS: I downloaded the e-book. PPS: This is my first book review at "A Lot of Pages" and I loved the experience! Do be gracious and show me some love. This is MSM saying Muchas Gracias in advance! Keep following for the next one in the Series... "BETRAYED" - Book Two of the House of Night Series. I read oops... I heard this book last month and I admit it was one of the most addictive boos for me .. Must add that the audio book i downloaded has amazing voice over for all the characters .. And specially i was mesmerized by the way Goddess speaks to Zoye .. and zoye .. thats such a sweet name :) I finished even the second part on next week ! You will like that too !! I agree when you say - Marked, Betrayed, Untamed and Hunted - all are a bit repetitive as the authors try to sketch and define Neferet and Kalona - it's sort of necessary evil. want me to do the review of second part ?? its still fresh with me so i can do ! @Nimue: Okay with me :) :):D Actually, seriously...thank you! *hugs* I will do "Chosen" which I am reading right now. Cool? I too am engrossed in 'Chosen' right now, waiting desperately to know what happens to Stevie Ray and why is Neferet doing all this stuff.